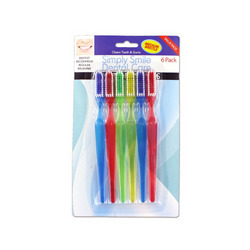 Perfect for families, this set of 6 toothbrushes helps clean teeth and gums. Each toothbrush is made with a transparent plastic and come in bright colors: blue, red, green and yellow. Set comes packaged in a blister card with hanging hole.